"An English anthropologist has discovered a frozen monster in the frozen wastes of Manchuria which he believes may be the Missing Link. He brings the creature back to Europe aboard a trans-Siberian express, but during the trip the monster thaws out and starts to butcher the passengers one by one." It's the 21st of October! Only ten days left until Hallowe'en! Are you getting excited? Have you bought your mask and enough candy from the dollar store to give you diabetes? What about movies? Did you check the shelves in Dollar Tree for some of the public domain gems which only turn up at this time of year? 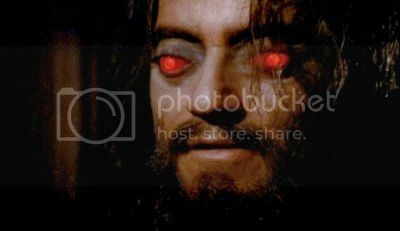 Last year, I was lucky enough to find "Horror Express" at one of my local branches of Dollar Tree and included it in my "I bought that for a dollar" series of posts. 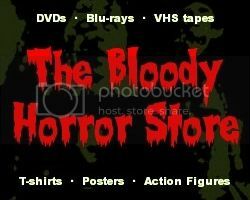 The Digiview Productions version is far from being the best transfer in the world - it looks like a VHS rip complete with tracking errors and tape damage - but it was only $1 for one of the greatest horror/sci-fi movies from the 1970s. 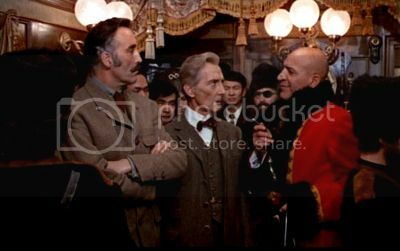 You just can't go wrong with anything starring Christopher Lee and Peter Cushing as a couple of pompous Edwardian Brits especially when the same movie also has Telly Savalas in far more than just a cameo appearance as a Cossack captain. It takes an hour for him to turn up, but Telly Savalas absolutely steals the show. That's no mean feat either since the entire cast are at the top of their game throughout. When I first saw "Horror Express" on the BBC far too many years ago to even remember the date, I was amazed that it was so underrated. "Horror Express" contains everything you could ever want from a horror movie including a kind of vampiric, body-hopping, alien monster, brutal kills, gore, beautiful women, and a resurrection of what can only be described as zombies near the end. There's even a mad monk who is Rasputin in all but name. With Father Pujardov (Alberto de Mendoza) and Inspector Mirov (Julio Peña) dominating most the screen time, it's pretty obvious that the Spanish cast could more than hold their own alongside more internationally famous actors. Sadly, this was the last movie for Julio Peña who died in 1972. After quite a successful career, Alberto de Mendoza also passed away in December last year at the age of 88. Since Peter Cushing, Telly Savalas, Alice Reinheart, José Jaspe, George Rigaud, Víctor Israel, and Barta Barri have also shuffled off their mortal coils, "Horror Express" is yet another one of those movies full of dead actors who were so important to many of us in our youth. Of course, if you are aren't in your late 30s or older then you won't know who any of them were. Eyecandy is provided by Silvia Tortosa, who plays Countess Irina Petrovski, and Helga Liné as an industrial spy who may well have inspired Famke Janssen's character, Trillian St. James, in "Deep Rising" (1998). Neither of them really do a lot, but Helga Liné provides a more lustful than usual Peter Cushing with some amusing moments. For a low-budget movie, "Horror Express" has a great atmosphere and manages to successfully deliver several old-fashioned scares. Notwithstanding the plot-holes and minor historical inaccuracies, "Horror Express" is one of the must see '70s classics which rivals "The Thing From Another World" (1951), "Invasion of the Body Snatchers" (1956) and their remakes.